About forty shops and 104 sewing machines caught fire; clothes for men and women, and other goods went up in smoke. It was around 2p.m. 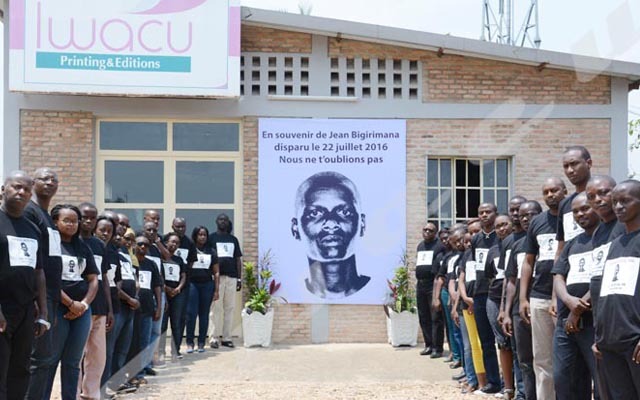 on 11 June when the fire erupted in “Ndayizamba” Gallery, the shop located between the company that supplies water and electricity [Regideso] and “Le Parisien” gallery in Bujumbura city center. “We have lost everything”, says Gloriose Nsengiyumva, a tailor. She says they had not enough time to save their goods and machines when the fire broke out in clothing shop. “It was closed. There was fatal chaos when the fire started. People ran in all directions and bandits rushed to loot different open shops”, she says. Antoine Ntemako, Director General of the Civil Protection police in the Ministry of Public Security, said the fire would have been caused by a short circuit. “Traders called for intervention and the civil protection police arrived at the place shortly, the reason why there was less damage”, says Ntemako. He says, however, the difficult access to the burning shops due to uncontrolled constructions of shops is among the challenges faced by the fire trucks. He also says, fire trucks are not sufficient enough to extinguish these fires which have become more frequent these days. “They have the capacity to work for six minutes without stopping. And if we use all the pressure needed, after six minutes we have to refill them with water. Then, we need tank and ladder trucks for big buildings”, he says. The Director General of the civil protection police says people are being sensitized to the use of tools to put out fire. “There are some people who are trained on the use of extinguishers but the lack of equipment hampers their work”, says Ntemako. On 27 January 2013, the Bujumbura central market caught fire. Few traders had insured their goods. Barnabé Nimubona, head of the fire and other risk services in the Burundi Insurance Company [SOCABU] says people have not yet understood the importance of insuring their goods. “We had paid BIF two billion to the traders who lost their goods in Bujumbura central market”, says Nimubona.